The author goes over a series of different animals and how they started in an egg and connects it to a human baby and how you started in mommy’s belly. The baby animals eventually all cracked out of the egg, and you, who came out of mommy’s belly. Next, it talks about how all the animals get mobile and learned to walk and some learned to fly; and how you started to walk. Eventually, the animals all and to go to their own baby beds to sleep in; the birds slept in her own nest; the bunny in his burrow; the duck in his reeds; and you, in your own crib. Finally, the book talks about how the animals are growing and you as well. The kitten will have her own basket to sleep in; the foal has her own stall now and the bully has a new doghouse; and finally, you, the big kid will have your own big bed. 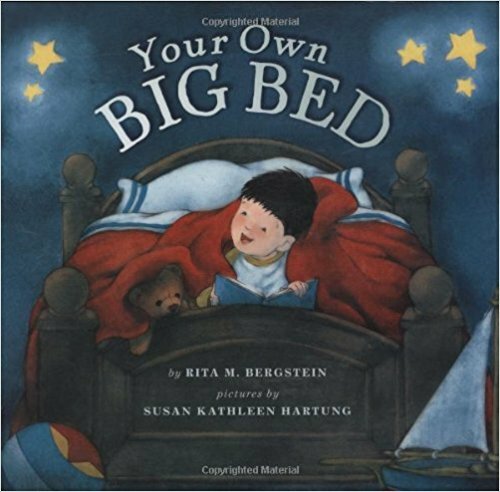 What a beautifully written story about growing up and having a big bed of your own! The illustrations are also beautiful! While exclusively breastfeeding with 2/3 of my children, I ended up co-sleeping with most of them and it was very difficult getting them to sleep in their own big bed. This book helped the children make the connection that the animals all started small and eventually had to sleep in their own big beds. that animals grow up and so do you. I like how at the end, the little boy was in his own big bed with his special stuffed animal. All our kids also sleep in their own big beds and and each have one or a few stuff animals that are their favorites that they sleep with overnight that they reach for instead of coming to my bed. The youngest is sleeping in her own bed for half the night now and still feeling the need to come and cuddle with me; so we are just going with the flow now ( as we did with the other two), until she is ready and be happy in her own bed all night.